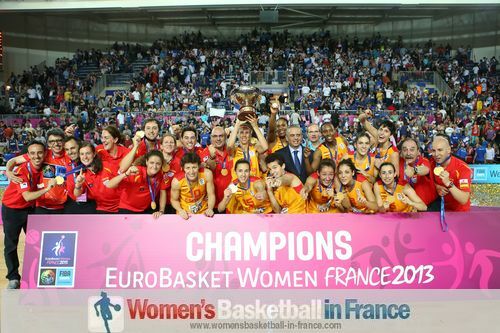 Spain beat France (70-69) in the final match of EuroBasket Women 2013. This is the second time Spain beat France in the final match of this competition. The first time was way back in 1993 by the score (63-53). Sancho Lyttle from Spain who was also voted MVP of the EuroBasket Women 2013 campaign finished her competition with 20 points and 11 rebounds was just too much for France to handle. In addition Alba Torrens who had 21 points and 4 assists was pretty accurate from beyond the arc (4-of-6) as Spain won their first title in 20 years at senior level. For France Sandrine Gruda was the leading scorer in the final with 25 points. Céline Dumerc followed with 11 points which included a perfect 3-of-3 from behind the arc. The 2013 EuroBasket Women all-tournament team was: Céline Dumerc (France), Frida Eldebrink (Sweden), Alba Torrens (Spain), Sancho Lyttle (Spain), Isabelle Yacoubou-Dehoui (France). Spain with three-pointers by Sancho Lyttle and Alba Torrens got off to a better start despite a rather defensive opening to lead (10-8) after four minutes. While Lyttle continued her festival for Spain, Sandrine Gruda picked up her offensive game with 6 first-quarter points to keep France on the tail of Spain (12-15) with a minute to play in the first quarter. The combination Edwige Lawson-Wade/Isabelle Yacoubou-Dehoui that had worked wonders in previous matches failed. Three times Yacoubou-Dehoui did not catch the pass by Lawson-Wade. The third time France were punished with Torrens intercepting and then racing up the court before dishing out a pass to Laia Palau who hit a three-pointer on the buzzer (21-12). Spain started the second quarter with a quick basket by Cindy Lima and a three-pointer by Torrens. Yet France finally picked up their offensive game with a baseline three-pointer by Céline Dumerc and 2 points by Gruda. Lucas Mondelo (in picture), the coach from Spain, decided to call an immediate time-out despite leading (26-19) with seven minutes to play in the quarter. France became more aggressive and won the crucial rebounds. Dumerc then hit her second three-pointer of the match and France were back on top. Back to back scores from Gruda put France in front for the first time of the game (27-26). Spain did not allow France to enjoy the lead for long with Lyttle scoring on the next attack. Torrens and Lyttle combined for 22 first-half points to take Spain into the locker room ahead (36-35). At the start of the third quarter, Torrens (in picture) did most of the scoring for Spain as the game went back and forth. However France continued to scrape and regained the lead for just the second time in the match with a three-pointer by Lawson-Wade (47-46). The pendulum appeared to be moving towards France with Gruda adding 2 more points. 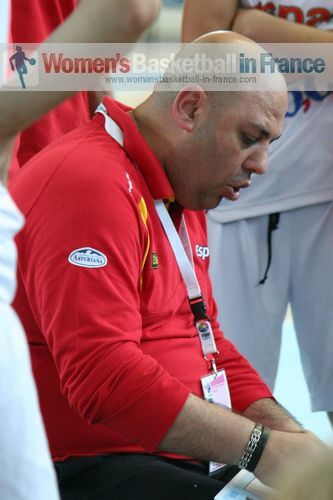 However once again Mondelo called a time-out to make some tactical changes. Lyttle and Gruda continued their battle while Spain took back the lead with a pair of free throws by Marta Xargay with two minutes left to play in the quarter. The match was becoming more sloppy with France finishing the third quarter in the lead (55-53) with Emméline Ndongue scoring after receiving a pass under the basket by Lawon-Wade. The officials stamped their authority on the game during the fourth quarter. France picked up 4 team fouls during the first 33 seconds. Spain were able to take advantage with a couple of three-point shots to go back in front (59-55). However with the frequent whistles and trips to the free-throw line the match was still nicely balanced (61-61) with 5:42 to play. Lyttle won the EuroBasket Women title for Spain by scoring the last 7 points for her team. France had their chance of winning the title especially after Céline Dumerc made it a 1-point game with two minutes to play. The ball failed to drop for France with two clear chances. By the time Gruda scored at the end it was too little and too late.